Rising International is turning to the community to help it win an important Huffington Post competition by June 6. Out of a group of more than 250 applicants, Rising International is proud to be one of the non-profits selected to compete for cash awards and international attention in the RaiseForWomen Challenge launched by Huffington Post and its partners on April 24. Currently, there are more than 100 organizations in the running from at least 150 cities in more than 35 states.Rising International, headquartered in Santa Cruz, is the only California Central Coast organization participating in the Challenge. The RaiseForWomen Challenge is an initiative to help women-focused non-profits gain resources and recognition. The challenge is to raise the most money by June 6 via the crowd funding platform, crowdrise.com. The RaiseForWomen Challenge is also providing unique short-term bonus vhallenge incentives that allow donors to achieve publicity for both the organization and the donors. Donors are urged to “like” the Rising International Facebook page to see the current challenge. Celebrating its 10th Anniversary, Rising International and its supporters are dedicated to helping to reduce poverty, trafficking and other horrific conditions for women locally and globally through economic empowerment. 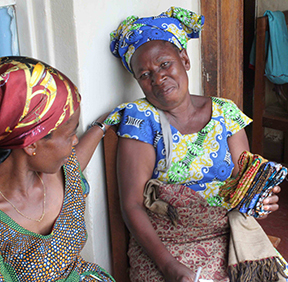 By using the popular “home party” model, Rising International provides disadvantaged artisans from more tan 20 of the poorest countries access to the American market. By selling their beautiful hand-crafted products and fashion accessories at Rising Home Parties the artisans earn enough money to improve their living conditions and leave what were previously hopeless situations. Think Avon with a social cause. Rising International Home Party hosts in the U.S. invite friends to their homes to shop and trained low income women and teens run the Rising International Home Parties as a business. It is a simple and effective approach that has changed thousands of lives here and abroad over the past decade. These local women entrepreneurs acquire career building skills, including leadership, business, sales and presentation skills that help them obtain better jobs, in addition to earning life changing supplemental income. Former East Salinas resident, Susana Camberos for example, used her earnings from her first three Rising International Home Parties to move her family to a safer neighborhood. Susana lost her brother to a drive-by-shooting. Santa Cruz native Paula Smith earns an average of $30 per hour running her own Rising International Home Party business. A domestic violence and cancer survivor, Smith never imagined herself as self-assured public speaker. Today you will often find her on stage at Rising International events sharing her triumphs and inspiring other women to believe in themselves. The Skoll Foundation, a partner in the RaiseForWomen Challenge, has agreed to pledge $50,000 in prizes for the top three organizations that raise the most money by the June 6th deadline. The Foundation is also giving an additional $25,000 for short-term goals throughout the challenge. Rising International won $3,000 by accomplishing the first short-term goal of securing 15 new donors from April 24 to May 6.